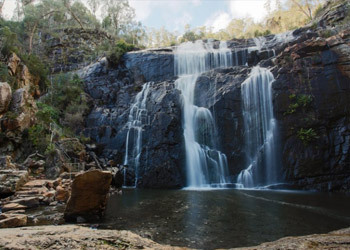 For further information on all the activities in our area then contact Visit Grampians on Freecall 1800 065 599 or click here to go to their website. Cross Fyans Creek (Barriyaloog Creek) footbridge and begin the steady climb through tall Messmate forest and native pines, along the western slope of the Mt William Range. 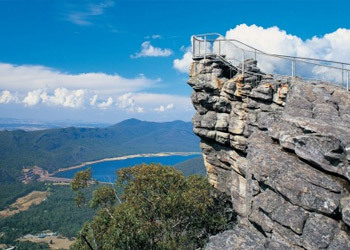 A scramble up the rocky summit rewards you with superb views towards Lake Fyans and over the Fyans valley. Return by the same route. Take care of cliffs and supervise children at all times. An information board in the car park provides an insight into the development of the historic tunnel. From the car park the track begins its steady climb past rocky outcrops to the top of the range. Descending the other side, you gain magnificent views of the Serra Range. 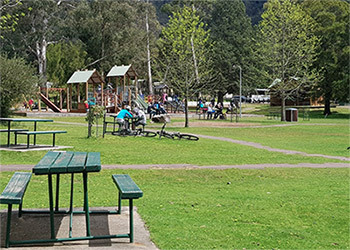 From a forest clearing, at the western tunnel entrance, you can return to the starting point or continue to Borough Huts Campground or to Halls Gap. Follow the sign posted track through open forest to the foot of Climatis Falls (best after rain). 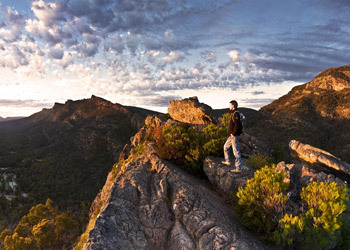 Return 100 metres to an intersection and follow sign posts and orange track markers along rocky areas, steeply up to the summit of Chautauqua Peak. Return to the main track and follow signs to Bullaces Glen, a lush fern gully under Blackwoods. Continue down through a fern grove to Mt Victory Road. Carefully cross this road, veering down a rocky track, and through the Botanic Gardens. Follow the track and cross the suspension bridge to the Botanic Gardens. Take the track to the right of the information board. The track winds up rock steps to Mt Victory Road. Carefully cross the road and begin a short climb to a waterfall at shady Bullaces Glen (best after rain). Continue across the creek, following signs back to Halls Gap. An uphill walk winds past rocky outcrops and through a stringbark forest. A series of steps leads to boardwalks which protect the moist heathland areas near Manja Shelter. Return by the same route. 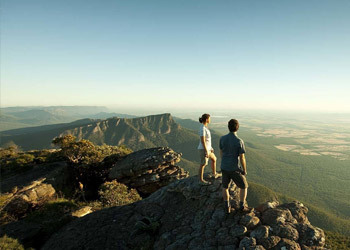 For more information on Aboriginal Culture, visit Brambuk, The National Park and Cultural Centre in Halls Gap.